← Do You Fondue ? Another similar take that I’ve fallen in love with is fresh strawberries, sour cream and brown sugar. Delicious! Indeed, this unlikely combination is truly delicious! I enjoyed this as dessert at my friend, Cathy’s house for dinner several years ago and I never forgot it. 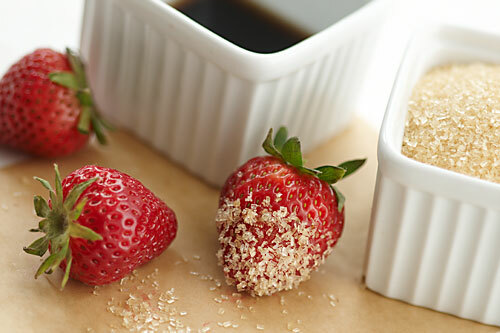 And beyond being delicious, “Berries, balsamic, and brown sugar” can provide an instant no-effort solution to “What’s for dessert?” Yum! Yum, Cathy – can’t wait to try this. Unlike your first reaction to it, it really appeals to me. I love salads with fruit in them, with red onions or shallots, and a lovely vinaigrette. Just recently made a salad with green beans, cherry tomatoes, jalapeno pepper and papaya. Delicious! I can’t wait to try this simple strawberry treat! Keep those great ideas coming! P.S. Your pictures are beautiful – makes me want to reach in and help myself. I love the ingredients in the salad you mentioned. The addition of jalapenos and papaya sound wonderful. What dressing did you use? Great idea for the upcoming local Strawberry season.